New recordings taken in the lush rainforest of central Africa have revealed never-before-seen (or heard) elephant behavior with startling images and audio. 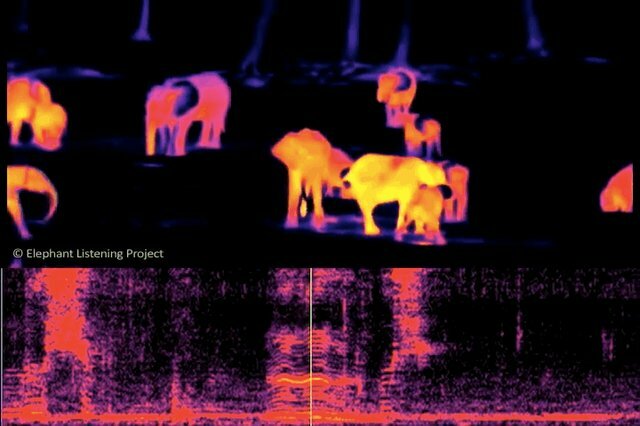 Thanks to new technology, researchers have been able to observe the secret worlds of forest elephants with stunning clarity. Peter H. Wrege, director of the Elephant Listening Project (ELP), at the Cornell Lab of Ornithology, has recorded over 300,000 hours of audio in the forest and 30,000 hours containing elephant calls, which, though not entirely analyzed yet, have already begun to yield unknown elephant secrets. Wrege and his team comb through the central African rainforest three times a year, placing microphones in trees that will pick up audio for up to six months at a time. Their target is the forest elephant, a third species of elephant that is distinct from the savannah elephant and the Indian elephant. Most people have heard an elephant trumpet -- the loud noise made to express excitement, distress or aggression. But even more interesting -- and more meaningful -- is the ultra-low frequency infrasonic "rumbles" that elephants emit and that are the focus of Wrege's research. These rumbles can be heard over several miles, and, as Wrege discovered, can be used for several different purposes. Mainly, the audio picks up on mothers calling to their babies, "telling them when it's time to leave," Wrege said, or calling for them to hurry up. "What we're recording actually are females talking to their babies and talking to each other. And males are sort of hanging out there and being quiet." He added that females, which are the talkative ones, greet one another with distinctive rumbles, even when they've been separated a long time. He also captured footage showing elephant interactions through infrared video -- technology that has never before been used in this way. According to Wrege, the elephants seem to have learned that it's safer to enter clearings at night, because poachers are less likely to be around -- a remarkable feat to have learned. But because of the dense foliage, it was nearly impossible to observe them. So Wrege used an infrared camera, which took this spectacular footage of a pair of elephants mating, and the fascinating subsequent social interactions -- females rush around the female who had mated, behavior that has never been observed before in this way. Wrege's microphones also pick up other noises of the rainforest -- chimpanzees, birds and, sadly, the sounds of poaching. He has recovered audio that records gunshots and the sounds of poachers butchering forest elephants, a horrific episode, even without a visual. Forest elephant poaching is one of the biggest poaching epidemics in the world -- according to estimates, there are about 100,000 forest elephants alive today, down from 500,000 in 1993. On average, 100 forest elephants are being killed daily. Like other elephant species, forest elephants are prized for their ivory, which can sell for $1,300 a pound on the black market. But, Wrege hopes, this technology, if developed, could be used as a real-time poaching alarm for rangers and conservationists. While it can do little to prevent a poaching attack from happening, the mics could alert authorities when an attack happens, so they can try to catch the poachers. Despite the poaching problem, Wrege maintains that all is not lost for forest elephants. In fact, compared to other elephants, he believes the species has "the best shot of living a normal, evolved lifestyle." "There are plenty of reasons to not have much hope,'' he said. "But there's still a chance."